Search all Old Retreat real estate listings in Pacific Grove, CA for homes for sale, condos for sale plus foreclosures, short sales and Pacific grove Old Retreat area information on one easy site. Pacific Grove's Old Retreat is a reference to the area in Pacific grove which was home to the old Methodist summer retreat which took place in Pacific Grove every year during this towns early days of development. The Old Retreat was a very specific area of town located below Pine from New Monterey's border to around Congress Avenue, although today the general area around downtown is loosely referred to as the Old Retreat. People love the Old Retreat area of Pacific Grove and Old Retreat real estate because of the uniquely Pacific Grove lifestyle it offers. The Old Retreat, as you will read below, was made of of tent structures in the early days so the lots are very small (30' x 60' to be exact) and don't allow for very large homes. The location is perfect as you can easily walk to the water, Lovers Point and downtown Pacific Grove. And although we are on rocky terrain, the terrain is relatively flat when compared with other seaside communities, making it an ideal place to walk. With all of that said, Pacific Grove's Old Retreat real estate is among the most desirable in the city. With 100 acres donated by the notorious local developer David Jacks, the Methodist Episcopal Church set off to develop a Christian Seaside Resort. Founded in 1875, Pacific Grove’s humble beginning was as a summer camp full of 30’ x 60’ tented lots where groups of Methodists came to rest, meditate and exchange ideas. The Pacific Grove Retreat was born. Every summer would start with 3 weeks of prayer meetings held in the middle of the Retreat in what is now Jewell Park on the corner of 17th Street and Central Avenue. Just a block down 17th Street is the famous destination in Pacific Grove called Lover’s Point that got its name from the church goers who called it “Lovers of Jesus Point.” Visitors would come and enjoy the beautiful climate, scenic beauty and of course the beaches all summer long. David Jacks still owned all of the other land surrounding the budding Pacific Grove Retreat including 7000 acres of what is most of the Monterey Peninsula and he had an opportunity to sell the land to The Pacific Improvement Company (owned by Crocker, Hopkins, Stanford and Huntington), who also owned Del Monte Properties which is now The Pebble Beach Company. This created quite a stir among the Retreat officials who were concerned they would lose control over their new community with high moral values. As it turned out they had nothing to worry about. Jacks was sure to write into the sale the same restrictions allowing the Retreat officials to ban card playing, dancing, liquor, dice, billiards and on Sunday swimming and sale of anything except medicine! Retreat officials had the right to search a home at any time. You couldn’t even pull down your shades at night as it was assumed you were doing something against the rules. A violation was punishable by loss of title to your property! The Pacific Grove Retreat constructed a fence to keep out those not worthy of entry and they kept is padlocked! Those under 18 years of age had to be in and off the streets by 8:00, 9:00 during summer months. There was even a restriction on the type of bathing suit that was allowed on the Pacific Grove beaches! The camp grounds with pop up tents maintained its original character for over 10 years. By 1887 the Retreat started to take on the character of the town we know today. Many of the visitors purchased the lot they rented and before you knew it there were small cottages lining the streets around downtown Pacific Grove and two-story Victorian mansions were starting to pop up as well. The Pacific Improvement Company had opened the Hotel Del Monte in Monterey in 1880 which in turn brought tons of tourists to the area. By 1887 Pacific Grove had its own hotel, also built by the Pacific Improvement Company called the El Carmelo which was located right downtown in the heart of the Retreat area. There were 1500 people living full time in Pacific Grove by 1890 and another 8000 to 9000 more here during the summer living in tents. Pacific Grove celebrates its official birthday (July of 1889) every year in July during the Feast of Lanterns Celebration. Today, Pacific Grove is known as America’s last hometown with over 1200 historical buildings. It has more Victorian homes per capita than any other city in America! Our website has detailed information including Pacific Grove Old Retreat real estate statistics. 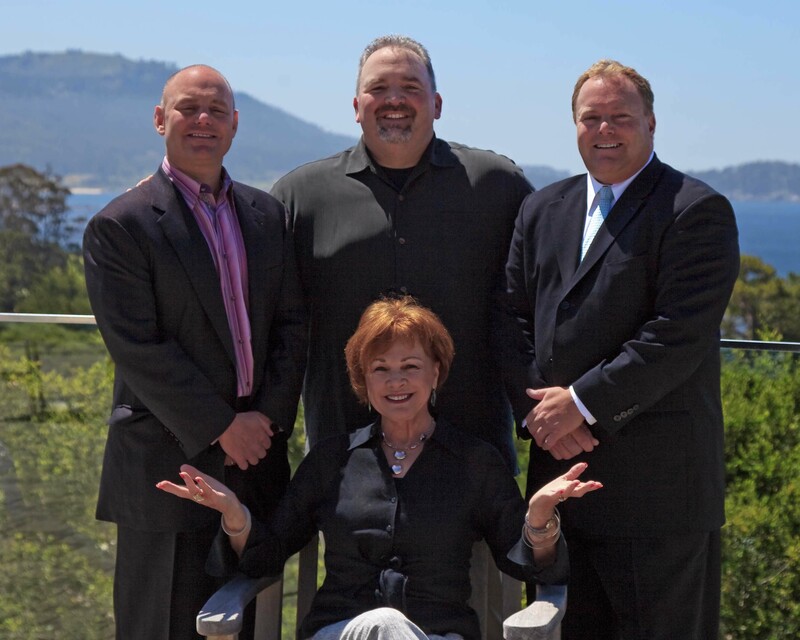 If you are interested in learning more about real estate values in this Pacific Grove, CA neighborhood, or if you are interested in seeing homes for sale in the Old Retreat area, contact us. 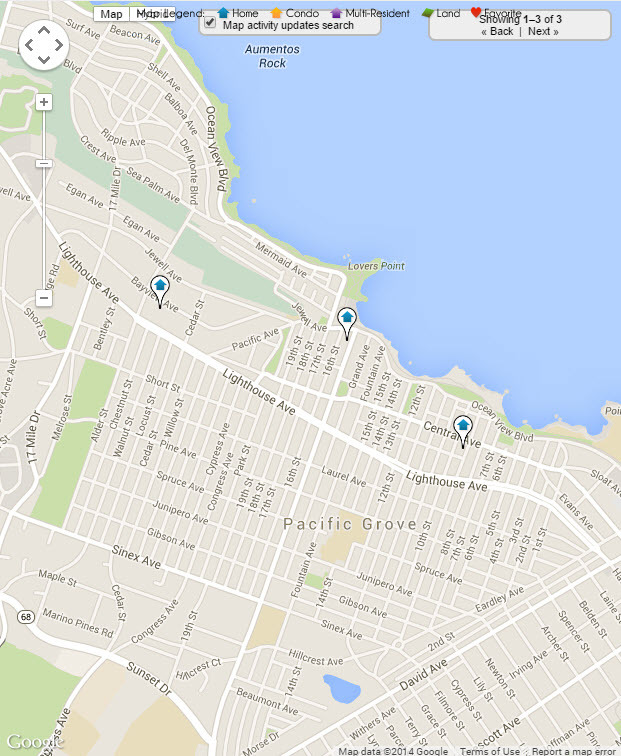 The latest listings of homes for sale in Pacific Grove's Old Retreat area are on this page. 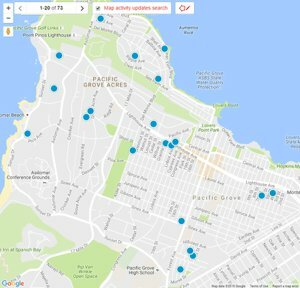 For a full list of every piece of real estate that is currently available in this sought after Pacific Grove neighborhood, you can build an advanced search or contact us and we can do it for you.